Our Boston knee replacement attorneys understand that many patients are suffering substantial pain and loss of mobility after having a surgery. And nobody warned them of the risks. According to a recent article from Fox News, former President George W. Bush recently underwent partial knee replacement on his left knee. Mr. Bush is 68 years of age. This was his second knee surgery. The first surgery was performed three month ago and was a partial knee replacement on his right knee. This partial knee replacement is in contrast to the more than 700,000 total knee replacements performed each year. As we have discussed in a previous blog entry, research suggests many total knee replacements are not medically necessary. Any patient who undergoes a total knee replacement is exposed to serious side effects including loss of flexibility, pain, stiffness, rejection, and even death. The fact that many patients are suffering these side effects when they may not have needed a total knee replacement in the first place illustrates the risks of today’s medical system. This article cites a British study, which found that patients with a total knee replacement were four times as likely to die within a month of surgery than those who had a partial knee replacement. They were also much more likely to experience a substantial complication following surgery. In addition to the “normal” complications of having a total knee replacement, as your Boston products liability attorney can explain, manufacturers of artificial knees have been flooding the market with dangerous or defective products. There have been numerous class actions lawsuits involving artificial knees. For example, the manufacturer of the Zimmer Nexgen artificial knee has recently recalled nearly 50,000 units because of manufacturing defects that can lead to infection, bone loss, and dislocation. It is important to note that a recall on an artificial knee is not like a recall on your new car. In the case of a car recall, you simply schedule an appointment, take the car into the service department of any dealer, sit around for a few hours, and take your now working car home. 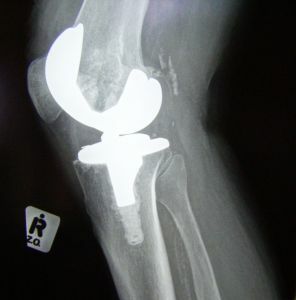 In the case of a defective artificial knee, you have may have to have another surgery to have the defective medical device removed and replaced with another artificial knee. This means going through the painful and difficult recovery period again. If you have already had an artificial knee implanted and are now having to undergo a second surgery to replace the knee, you may have products liability case against the manufacturer, and you should contact an attorney who regularly represents people in your situation as soon as possible. The second surgery can be painful and leave you in a worse state than you were in before having any knee surgery. This is especially true if you were one of the many patients who had an elective knee replacement that wasn’t medically necessary in the first place. If you are the victim of a defective medical device in Boston, call the Law Offices of Jeffrey S. Glassman for a free and confidential appointment: 1-888-367-2900.